Israeli Prime Minister Benjamin Netanyahu said on Sunday that Israel had carried out an air strike on allegedly Iranian weapons in Syria at the weekend, a rare public confirmation of such attacks. "We have been taking action with impressive success to arrest Iran's military entrenchment in Syria," Netanyahu said at the start of a cabinet meeting on Sunday, according to his office. "Just in the last 36 hours the air force attacked Iranian warehouses containing Iranian weapons in the Damascus international airport. Netanyahu added that Israel had attacked Iranian and Hezbollah targets in Syria hundreds of times, AFP news agency reported. The Israeli prime minister is facing a 9 April election and has been looking to burnish his security credentials - despite several ongoing corruption cases involving him and his family. Syrian state news agency SANA cited a military source saying on Friday night that Syrian air defences had shot down Israeli missiles, but that a warehouse had been hit. Most of the missiles fired by "Israeli military planes" were intercepted at around 11pm (2100 GMT), the source said. The Syrian Observatory for Human Rights said "two areas hosting military positions of Iranian forces and the Lebanese Hezbollah movement have been targeted". 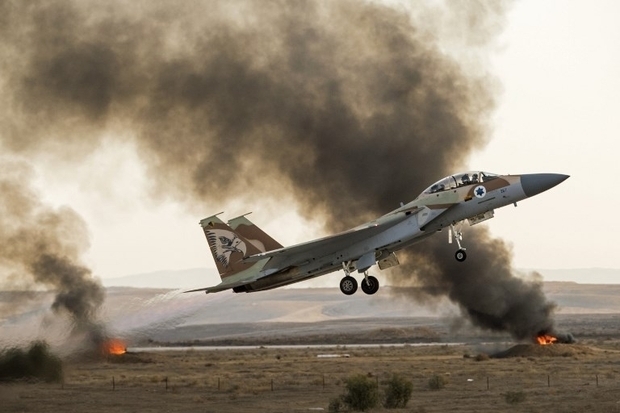 Israel has pledged to prevent Iran from entrenching itself militarily in Syria, where it is backing President Bashar al-Assad's regime alongside Russia and Hezbollah. Eisenkot told the New York Times on Friday that "we struck thousands of targets without claiming responsibility or asking for credit". The attacks against Iranian targets and not only on Hezbollah arms convoys, were authorised by cabinet in 2017, he explained in his interview to the US newspaper. "We noticed a significant change in Iran's strategy. Their vision was to have significant influence in Syria by building a force of up to 100,000 Shia fighters from Pakistan, Afghanistan and Iraq," claimed Eisenkot. "They built intelligence bases and an air force base within each Syrian air base."